C2) was the client of choice. 57 players participated in the Double Elimination brackets, about 100 matches got played. Blink and Okey_Dokey organized the tournament; z2sam and kb1900 recorded or streamed most matches; twirler (aka apm10) and elderSloth (aka officegunner) commentated some later matches; iljain, cn_ (aka sad) and Franckow helped in several ways (recording, streaming, commentating); and leilickan contacted C2 developer Simon and edited C2's message of the day. Cultris II is a fan made client for PC and Mac inspired by classic Tetris. It shows only the next piece (1 preview), there's no Hold feature and its randomizer generates hard (to predict) piece sequences (the chances for experiencing floods of one piece shape are reduced though). However, that's pretty much all what it has in common with classic Tetris. It's very fast paced - the fastest players drop roughly 3 pieces per second - and it uses a time based combo system to determine how many garbage lines are sent to the opponents (C2's garbage is very messy btw). Clearing multiple lines at once at the start of a combo gives more time to perform a combo - that's why you often see the top players starting with a Tetris. For every piece placement that clears at least one line, the combo counter is increased by 1. For every placement that doesn't clear any line, 0.4 seconds are subtracted from the remaining combo time. So, a combo mustn't consist of consecutive line clears in C2, but clearing no lines too often will keep the combo short. That's why you often see the top players making only Singles at the end of a combo. In the predictions, people favored Martin from Argentina to win this tournament. Martin held rank 1 in FFA for a long time; he placed second in ICL 2 and ICL 3 but never won a big Cultris II tournament before. Other favorites were iljain from Taiwan, SlickaLei (aka LapSiLap) from Sweden and Franckow from Argentina. iljain placed second in ICL 1; SlickaLei is rank 1 in FFA since over a year (and he is a former 40 lines WR holder in NullpoMino). The female players leilickan (Sweden) and ProMouse (aka Delfinaa) were also among the favorites. ProMouse is Martin's teen sister; with a time of 27.66 seconds she's the current leader of C2's 40 lines board ("Maserati"). The 2 best performing players would get a bot of their name as prize, whereas only the winner's bot would have an avatar. The tournament used Double Elimination, that means players that lost once would remain in the tournament, but they would be transferred to the losers bracket where the way to the finals would be much longer. Early rounds were played first to 15 (win by 2), later rounds were first to 11, "best of 3" (2 sets to win). 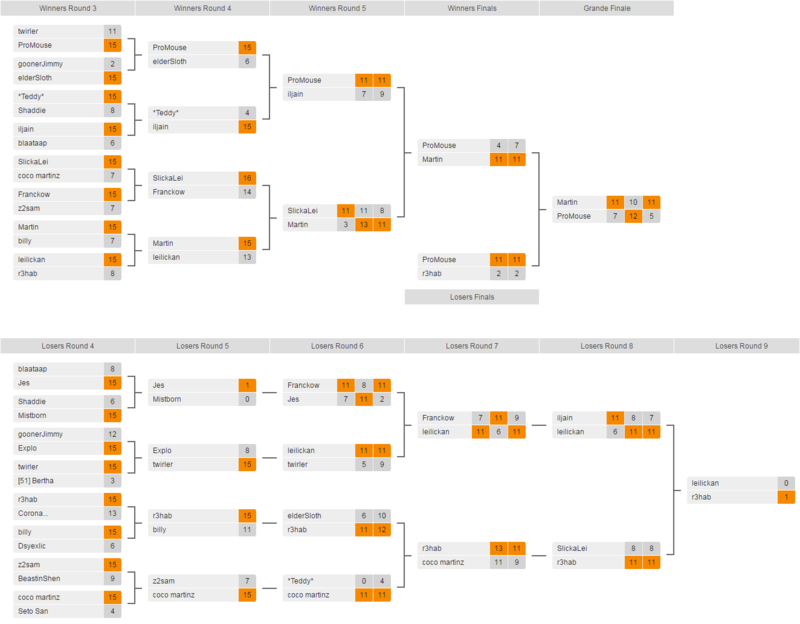 The brackets were totally random (no seedings) besides the top 7 FFA players getting byes in round 1. That's why some top players met rather early (e.g. Jes vs r3hab or Martin vs Mistborn in round 2) and a few pretty good players were eliminated pretty early (e.g. tatianyi after 2 close losses against coco martinz and Corona...). The last 8 players left in the winners bracket were ProMouse (Argentina), elderSloth (UK), *Teddy* (Korea), iljain (Taiwan), SlickaLei (Sweden), Franckow (Argentina), Martin (Argentina) and leilickan (Sweden). SlickaLei beat Franckow in a very close match. Martin avenged his countryman Franckow by beating the 2 Swedes leilickan and SlickaLei in 2 again close matches. Meanwhile, ProMouse won her games against elderSloth and iljain thus had to face her older brother Martin in the winners bracket finals. There she lost in 2 clear sets (gossip has it that Martin made her laugh during that match). With Jes (Denmark) and Mistborn (aka GoldenShadow, USA), we had 2 good players who were sent to losers bracket very early (in round 2). They performed well there and would have to face each other, but a Mac upgrade broke Cultris 2 on Mistborn's computer. Jes was then eliminated in the following round by Franckow. Another 2 players who performed well in losers bracket were r3hab (aka piper, USA) and coco martinz (USA). r3hab won their duel in 2 very close sets. Meanwhile, leilickan got under time pressure because she had to leave for vacation. She managed to beat Franckow and iljain both in 3 sets and played some further presumptive matches before vacation which in the end didn't count because r3hab managed to beat SlickaLei. In that alternative timeline, she would have placed second. Since leilickan was in vacation then, she decided to forfeit her match against r3hab (to not delay the tournament) and abdicated her almost guaranteed second place and bot prize (note that she was the one who sent r3hab to the losers bracket in a rather clear match). Then, r3hab lost to ProMouse in 2 clear sets in the losers bracket finals and became third in the tournament. So, ProMouse had to face her brother Martin again in the match for the championship title. The corresponding match is embedded below. ProMouse is the bit faster player - sometimes even breaking the 200 BPM (blocks per minute) barrier. Martin on the other hand has more knowedge of spins/twists and is probably also a bit better in timing/observing his enemy. Martin won the first set. ProMouse turned around the second set, parrying a match point. However, Martin didn't miss out on anything in the third set. So, Martin won Hard Drop Open VIII. Congratulations. As reward, he gets a bot with his avatar in the next Cultris II update. ProMouse still gets a bot with her name.